Companies unsatisfied with performance and that rely on cash alone to reward and incentivize their staff may be interested in a study conducted by Shaffer and Arkes (2009), that found that when people make a hypothetical choice between cash and non-cash incentives, cash is indeed preferred by many employees. However, and here’s the hook, when it’s no longer hypothetical, meaning when an award is identified, employees actually performed better in pursuit of it, even when the award was of equal value to the cash alternative. As organizations look to do more with less, the argument can be effectively made that introducing a non-cash component to a pay-for-performance scheme may make it more effective and therefor, more efficient than one with an all cash payout. Today over 83% of firms have some sort of performance based pay in place. While they have bought into the concept, may are still asking if they are getting the rate of return that they anticipated. The satisfaction gap opens a window for award providers to suggest/position non-cash recognition as an alternative incentive. 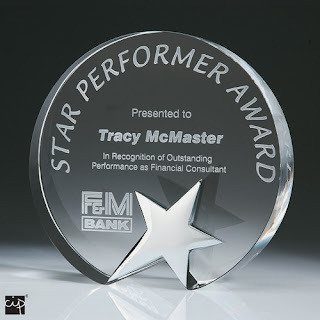 A study this year by Jeffrey & Adomdza (2011), found that non-cash awards capture employee attention. The authors concluded that employees think more frequently about these awards, even when they are in equal value to cash, and that the increased interest leads to higher performance. A comparative study published in The Journal of Personal Selling and Sales Management compared cash versus non-cash rewards among 45 insurance agents. The study revealed that travel and entertainment outperformed cash as incentives for agents to acquire new customers. The conclusion that cash is always more effective simply doesn’t hold up with study after study refuting this notion. These recent studies show that awards, merchandise and non-cash incentives offer more influence over people and can be more powerful-and more profitable-than cash alternatives. For more information, contact RCB Awards at www.rcbaward.com. On Wednesday April 18, Curt Denevan of RCB Awards announced that the company, in conjunction with the Journal Sentinel Preps Plus, will donate a Sportsmanship Award to every local high school in southeastern Wisconsin. These awards are meant to highlight in each high school examples of great sportsmanship on the field of play. Too often class athletes are overlooked unless they are the leading scorer. This award allows the athletic director to select the student athlete that demonstrates the true spirit of sportsmanship. RCB will also donate Academic Achievement Award to recognize outstanding academic honors. Each high school principal will be asked to determine their criteria for the award. The idea is that there are students who really put in extra effort and succeed. They should be recognized, not just the Valedictorian. An announcement was sent to each southeastern Wisconsin athletic director and principal this week explaining the program and asking them to select their award recipients. For additional information on awards for athletic and academic achievement, contact Curt Denevan or visit www.rcbawards.com. RCB Awards is an award and recognition firm based in Milwaukee, Wisconsin specializing in non-profit and corporate award programs for the last 20 years. Pretty frightening statistics. These come from a September 2011 Globoforce Work Mood Tracker survey which got input from employed U.S. workers to determine how recognition affects their work. If you feel that perhaps you have waited too long to show your employees some appreciation, know this: Even when employees have one foot out the door, 77% of employees dissatisfied with their employer say they would work harder if their efforts were better recognized. While the solution seems simple, it all starts with the commitment from the top. Is your senior leadership committed to effective employee recognition, or is everyone too busy? Clearly, with these statistics, if you ignore your employees, they'll go away. For more information on employee recognition programs, see www.rcbawards.com. Labels: reasons for giving awards, why give awards? Interesting thoughts provided by Mike Liubinskas, the co-founder of Pollenizer & Web Startups and a graduate of the Australian Graduate School of Management. Young people want more recognition than financial. Combining them reduces the value of each - i.e. paying someone for an excellent job takes away from the positive esteem value of the recognition. Teams are more likely to share positive recognition with each other if it's pure recognition. People want a balance of daily small bits of recognition and occasional (a few times per year) big recognition. Seems like the folks in Sidney see things pretty much the same as we do over here. For more information on recognition, see www.rcbawards.com. For more information, call RCB Awards at 1-800-929-9110 even if you would like help with an inscription, we would be glad to help. I have a dream. Come with me on this journey. Employees spring out of bed excited to go to work each day. 87% are more likely to stay in their jobs. Managers seek to bring out the strengths of employees, not to harp on the weaknesses. 70% more likely to be nice to customers. Authentic recognition results in behavior that is social, strategic and powerful. Profitability increases at the firm. Engagement strengthens relationships at work. Work is social. Its about people. Progress is visible at work, demonstrating the key to motivation. Energy drives us: Spiritual, physical, emotional and mental. Energy is caught up in a mission that is greater than ourselves. Engaged employees formulate the results the company should be seeking. Powerful results matter to managers, organizations, employees and customers. Managers figure out how to make top performance worthy of employees' attention and provide feedback that is heard and followed by those employees. Work is meaningful. Managers know this will sustain, engage and enrich people. Magic Moments are nurtured. Make the most of these Magic Moments when managers engage with employees. Every connection you make, every day, has the potential to become a low point or a high point in someone's day. Make it a high point. Toxic aspects of the workplace are eliminated. Employees are allowed to find a sense of well-being at work so they leave each day enlightened, not depleted. I have a dream. That this will touch everyone. Check out the short video from The Employee Engagement Network. 7 out of 10 Americans say work unrecognized! ARA, the industry organization promoting recognition. recognition program, just a little effort. giving a pat on the back, or creating an award,“ she said. can infuse positive energy and help boost morale. staff with raises and bonuses,” she said. Make sure all employees must be eligible for the recognition. Be sure that both employers and employees have specific information about what behaviors or actions are being rewarded or recognized. Ensure that anyone who performs at the level or standard stated in the criteria receives the award. Take steps to recognize all honorees as close to the performance of the actions as possible so the recognition reinforces behavior the employer or organization wants to encourage. Does it represent what was accomplished? Is it attractive enough to wear or keep at home or in the office? Is it consistent with the purpose and image of the organization and/or accomplishment? Is it right for the level of representative of the importance of the achievement? Is it in line with the budget/effort? Is the award well-crafted from high quality/affordable materials? For additional guidelines for award program, visit www.rcbawards.com. value and significance of awards and recognition programs. Do you have a recognition program in your company? In May of 2011, World At Work-the Total Rewards Association, reported that 86% of companies have recognition programs in place. The average percent of payroll budgeted for recognition is at 2%, down from 2.7% in 2008, but still significant. Recognition programs for these companies boost employee satisfaction (71%), motivation (66%) and engagement (64%). Awards for length of service are still the most prevalent, but more and more we are seeing companies using awards for “above and beyond” performance recognition (79%). The survey indicates that companies are opting in for programs that can have a more direct impact on their bottom line. That includes consideration of such things as engagement which leads to commitment and loyalty. Trends in the awards industry show a tendency to continue or strengthen annual or quarterly award programs. There is a tendency toward centralization of awards purchases as buying decisions are increasingly made by the corporate office rather than individual departments. Demand for awards is increasing according to those in the industry. More companies are working on custom awards, something unique to the marketplace, which only their company will have. Corporations seem to be ordering more than they have in the past. They want to make sure their employees are recognized. Raises and promotions may not be as prevalent-or even possible. There is a tendency to try to motivate people to do more. When the economy isn’t all that great and sales may be down, recognition tends to be an economical way to boost sales activity. Another interesting trend is a movement away from plaques and toward glass and crystal awards. As companies look for something new and exciting to present, they are looking for awards that will be cubicle friendly. Corporate customers are looking for awards that look really classy, are personal in nature, and many cases, let the inscription or etching design carry the award. This allows the artistry of the award designer to become more valuable than the award itself. For more information, see RCB Awards.